A new look at mountain birds is helping Yale University researchers test long-held assumptions about species richness in high elevations. The idea that species diversity decreases as you move into higher elevations — after a potential peak at middle elevations — is one of the most recognized and general patterns in ecology, according to scientists. Yet that assertion has not yet been tested nor studied at the evolutionary level on a global scale. In a study published online Feb. 21 in the journal Nature, researchers Ignacio Quintero and Walter Jetz provide just such an assessment. The study makes use of a comprehensive global database that addresses lateral and elevation species distributions, combined with innovative analytical algorithms developed by the researchers. Mountains have been thought to increase the rate of new bird species being formed because they act as barriers between populations. Similarly, mountains are believed to have lower extinction rates because they can be environmental buffers when global climate changes. Surprisingly, said the researchers, the new study finds that rates of species formation are higher at upper elevations — that is, the same places where species richness is lowest. This is counter to the traditional view of higher rates of species formation as the driver behind the most species-rich locations. 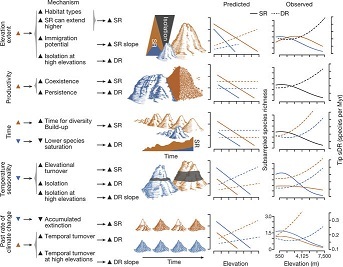 The authors noted that high species richness may instead be largely the result of greater climatic stability, allowing for the accumulation of species through geologic history. “Current gradients of biodiversity may be influenced to a greater extent by differences in the maintenance rather than in the origin of species,” said Quintero. “Our results suggest that historical processes such as frequent extinctions and immigrations from other areas are key mechanisms in high-elevation ecosystems,” said Jetz, associate professor of ecology and evolutionary biology at Yale and director of the Yale Center for Biodiversity and Global Change. Jetz and Quintero noted that as species in mountainous areas come under increasing threat from both climate change and habitat loss, it will be essential to better pinpoint the often-shrinking ranges of these species via better geographic information. That effort is part of the mission of Yale’s Map of Life project that aims to improve the global spatial knowledge for conservation decision-making.